Here is my son, Philip Blattenberger (2½ years old here), holding his first model airplane - a Comet Cadet. 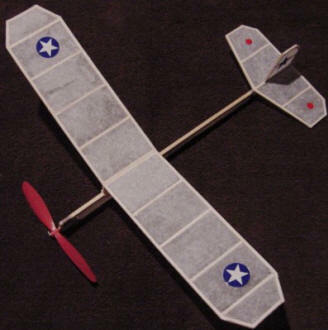 The Comet Cadet is a very simple model built of sticks and covered with tissue paper. 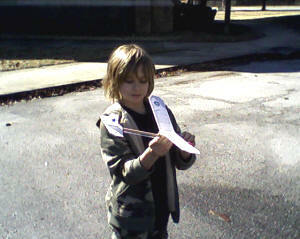 The propeller assembly is of the type supplied with the dime store balsa flyers with a stick fuselage. 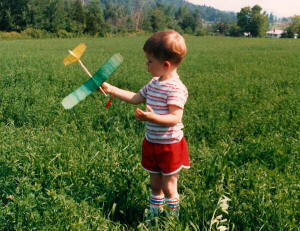 This photo was taken sometime around 1988 in Hinesburg, Vermont. At the time, I was completing my electrical engineering degree at the University of Vermont. I still have that original model, although it is in pretty bad shape after about a dozen household moves. At some point I will rebuild and recover it back to its original state. I recently won an eBay auction for a Comet Cadet; a photo of it can be seen to the left. The box is still sealed in its original plastic wrapper. I want to take this opportunity to thank eBay merchant Matty's Collectibles for patience in waiting for a bank snafu to be cleared. In January of 2009, I finally finished re-covering my Comet Cadet. The tissue paper had gotten extremely brittle from sitting in our attic for two decades. Here are a few photographs of the Comet. You can see where I added diagonal braces in-between the rib bays in order to counter the twisting tendency. Japanese tissue is used with nitrate dope both for attaching the tissue to the frame and for a couple coats of 50/50 dope/thinner. A friend of mine, Tom Eastlake, recently sent me a photo of a Comet Cadet that he built for his nephew. "This thing flies pretty well. " Tom has a unique building board setup for small models. He lays a thin sheet of glass over the plans, and then holds parts in place with masking tape. According to Tom, Guillows is producing Cadet kits once again. For a while, about the only place to get one was on eBay. See Tom's 16½" wingspan Supermarine Spitfire (Guillow's) here.